Ride sharing – and particularly ride sharing in electric cars – seems to be our best option for reducing emissions and cutting down on urban traffic. The microMAX concept from Swiss automotive think tank Rinspeed is designed to be the perfect in-city ride sharing vehicle. The car will encourage more people to ride as passengers rather than driving themselves by making it easier than ever to catch a ride with a nearby driver. A smartphone app lets you request a pick-up in real time so you can get where you need to go without hanging around waiting forever. The size and shape of the concept car is notable on its own. The design eschews the conventional vehicle layout and offers standing room only for three passengers and a driver. The arrangement allows the car to take on a small horizontal footprint – it’s just a shade under 12 feet long – but requires a super-tall 7.2 foot height. 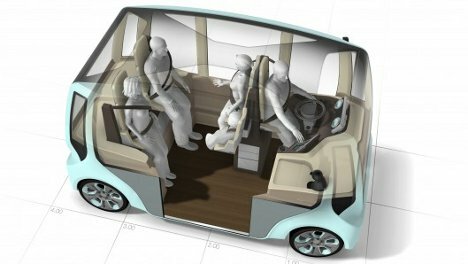 According to the designers, the car is only meant for short-haul rides, like getting you from the supermarket to your home, so the strange standing-up configuration won’t get too uncomfortable. There are little ledges to lean on and seat belts to strap passengers in, so it isn’t exactly like standing up for the whole ride. Unlimited connectivity, free coffee and a little fridge for passenger’s drinks all sweeten the deal for potential riders. See more in Mass Transit or under Transportation. December, 2012.